Customize your trip with a local travel expert in Vietnam. There is no better way to explore Vietnam than on a bicycle. Whether it’s cycling through the pancake-flat sprawl of the Mekong Delta, the cultural echoes of Hoi An’s colonial French beauty, mountain biking in the Cat Tien National Park, or the bustling daily life of Hanoi and Ho Chi Minh City, a bike seat guarantees the best views of Vietnam! Vietnam loves their two-wheeled pedal power, and there is no better way to explore this country. Cycling’s more sedate pace brings you up close and personal with the locals allowing you to glimpse their culture in a way that simply isn't possible with more impatient means of transportation. The statue of Ho Chi Minh with People's Committee Building at the back. Exploring by bicycle provides visitors with indelible insights into the rich culture, history and bustling daily life of Ho Chi Minh City’s locals. Take in the beautiful French colonial period architecture, including its signature Opera House, Notre Dame Cathedral, and General Post Office. Investigate into the city's bustling Chinatown, including a visit to the amazing Cholon and Binh Tay Market. Finally, visit the Reunification Palace, home to the President of South Vietnam during the Vietnam War. Then refresh and revive your spirits at the food stalls at Ben Thanh market or enjoy a glass or two of street-side beer, known as Bia hoi. Hanoi is a city that almost seems tailor-made for cycling. 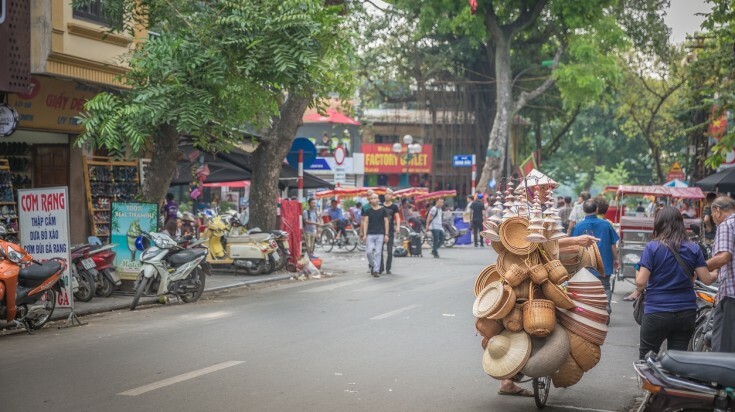 Hanoi is tailor-made for cycling, and it is the perfect place to come to grips with the bedlam of Vietnamese traffic and its equally chaotic street life. Replete with beautiful lakes, parks, and delightful tree-lined boulevards, the city’s slow moving and laid back vibe makes getting around on a bike easy and hassle-free. 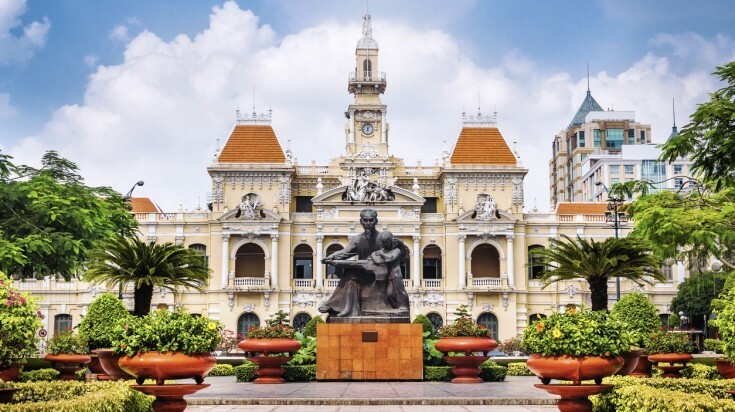 Start by visiting the Ho Chi Minh Mausoleum complex, resting place of Vietnam’s founding father for whom the Ho Chi Minh city is named after. As well as being Ho Chi Minh’s former residence, it houses the Buddhist One Pillar Pagoda. Then it’s on to the vibrant Old Quarter, a veritable architectural museum evoking a 1930s provincial French village. The ‘36 Streets’ are a bargain hunter's paradise thanks to their amazing selection of shops selling everything from elegant silk clothing, to sublime jewelry and lacquerware. At night, explore Hanoi’s legendary street food scene through the hole-in-the-wall vendors serving steaming bowls of Pho. Take a cycling tour starting from Hanoi with this tour and cycle to the Northwest mountains of Vietnam. Explore North Vietnam on this 10-day tour that starts and ends in Hanoi. West Lake. The Three Bridges takes you over the Red River. 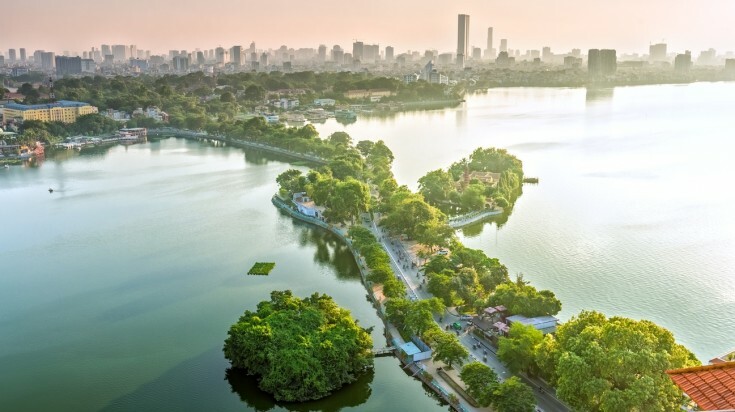 Step out of Hanoi’s daily maelstrom and head your bike toward Hanoi’s more sedate back roads running along the Red River. This is a popular cycling route, thanks to its easy-going grades and tranquil scenery ranging from cornfields to the Red River floodplains. The route takes cyclists over three bridges. Each has separate lanes for motorcycles and bicycles. The Tran Quoc Pagoda in early morning light is particularly photogenic. The ride offers visitors the chance to discover another side of Hanoi. Sapa is one of Vietnam's scenic mountain regions. Photogenic Sapa nestles in Vietnam’s mountainous northern region. Its lush landscapes feature soft clouds scudding across craggy mountain ranges and pose a test for the hardiest of tires. Along the biking route, visitors have the opportunity to encounter Vietnam’s vibrant ethnic minority communities. One of the region’s highlights is its web of terraced rice paddies carved out of the very sides of the mountains. These terraces transform the hillsides into a beautiful cascade of yellow during harvesting. The five main ethnic groups that call the Highlands home are the Hmong, Zay, Yao, Tay and Xa Pho, tribes. They live in scattered hamlets dotted throughout the valleys. 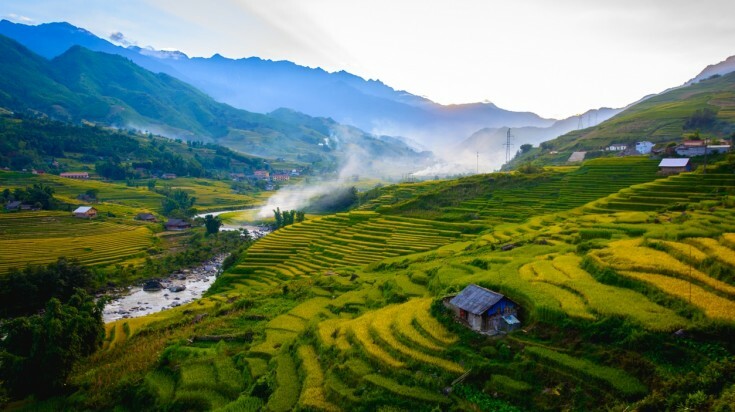 Sapa itself is where the tribal people gather to sell their rice, corn, and fruits, together with traditional handicrafts and souvenirs to tourists. 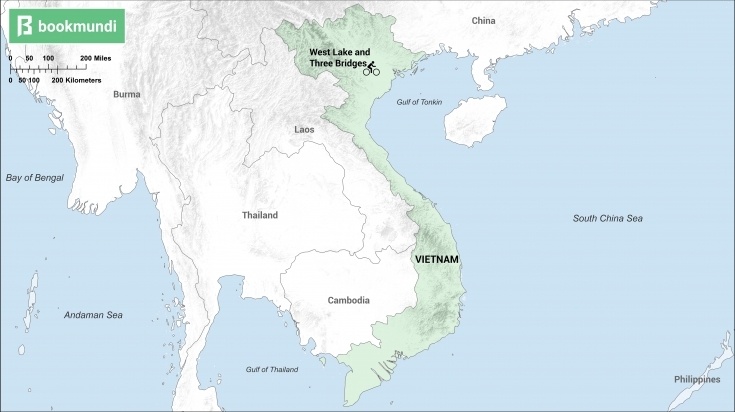 The mighty Mekong’s labyrinth of shifting tributaries dominates southern Vietnam. 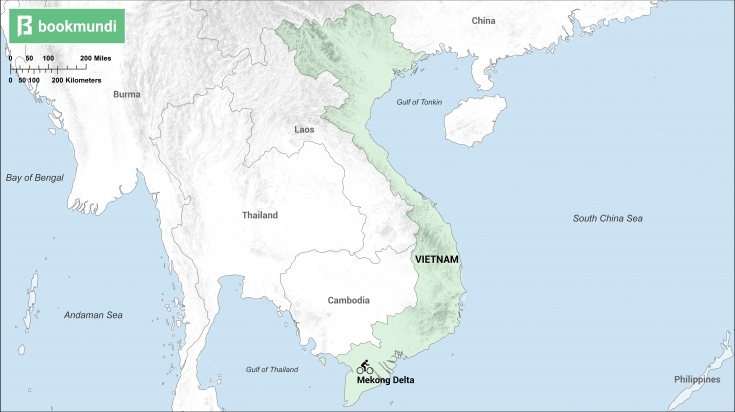 Over the centuries it has created a vast fertile delta, enabling Vietnam to be one of Asia’s largest producers of rice, fruit and vegetables. 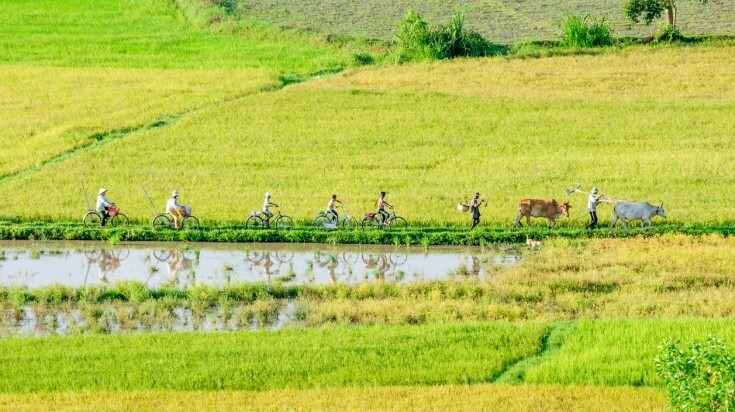 Cycling through Mekong Delta provides endless rice paddies and blissful orchards, skirted by hordes of irrigation canals as you ride from village to village, brings to life a unique aspect of everyday Vietnam. The road through the Mekong Delta is delightfully flat, making for easy riding and enabling visitors to admire the idyllic scenery as rice paddies float across to the horizon. Here, locals live both next to and on the complex network of rivers, canals and streams. Cyclers will experience picturesque riverside towns, a dizzying range of shades of green and colorful floating markets. 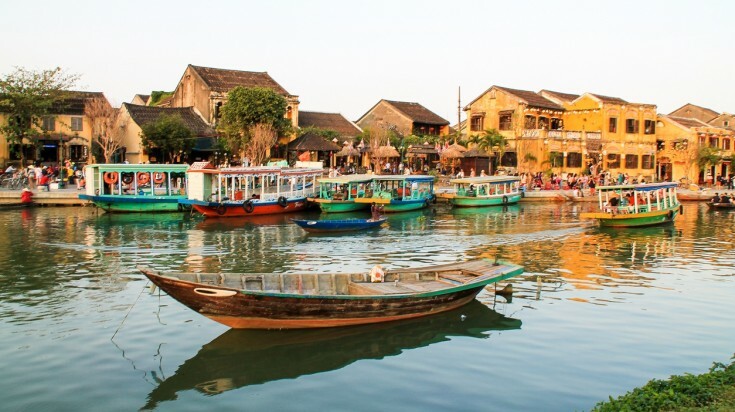 Hoi An has a 'No Cars Zone', but there's plenty of tranquil river activity at the nearby river. Hoi An is a “must see” part of any Vietnam cycling trip. This city provides a distinctive change of pace with its lantern-lit streets, thriving markets, master tailors, artisan shops, ancient temples and traffic-free roads. The Hai Van (Ocean Cloud) Pass leading to Hoi An is a sublime stretch of winding highway threading through the Truong Son mountain range with views across the Bay of Danang to the south. Cycling through its quaint rural setting will take you past rice paddies, wallowing water buffalo, bamboo houses and bamboo flanked mountain ranges. These are surely among Vietnam’s most iconic images. Now a World Heritage site, Hoi An is being deftly restored and preserved for future generations with parts of the town restored to their appearance of more than a century ago. Soak up the ambience and rest your legs at a local restaurant after a great day’s riding. Take the 7-day Vietnam Heritage by Bicycle Tour and visit Hoi An along with Hue, Land Co and My Son. Adding the route to the Cat Tien National Park adds a fresh dimension to any cycling tour of Vietnam. Set in Vietnam’s south, roughly 150 kilometres north of Ho Chi Minh, the Cat Tien National Park takes intrepid cyclists past lava tubes, rubber and coffee plantations, and strands of Teak forest, before winding through wild elephant territory in the midst of its rich lowland tropical rainforest and wetland-flooded evergreen ecosystems. The park is an ideal setting for mountain biking and wildlife-spotting thanks to its extraordinary biodiversity. Here the elusive Javan rhinoceros keeps company with animals like tigers, gaurs and exotic birds. The mountain biking path itself features challenging steep sections of volcanic rocks. The Vietnamese people view the National Highway 1A as the symbol of national unity. 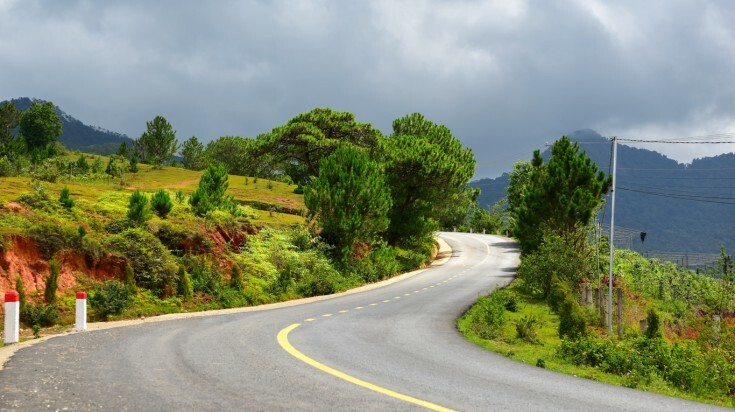 Surely, Vietnam’s National Highway 1 is one of the world’s great cycling adventures. 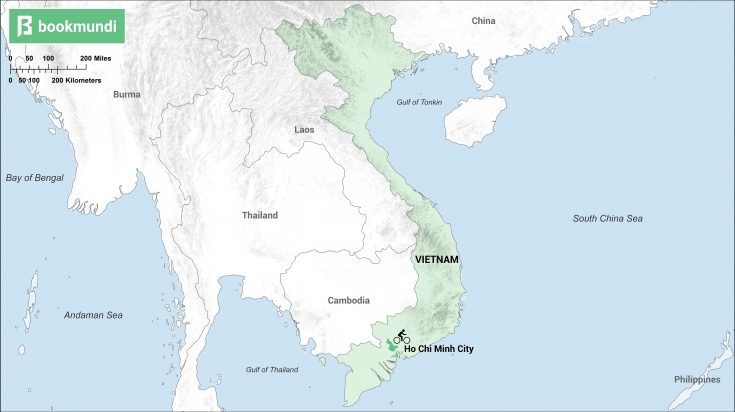 Running from north to south down the narrow coastal country strip, it connects Hanoi with Ho Chi Minh. Vietnamese now view Highway 1 as a symbol of national unity. Cycling Highway 1 unlocks experiences most travelers in a hurry miss. 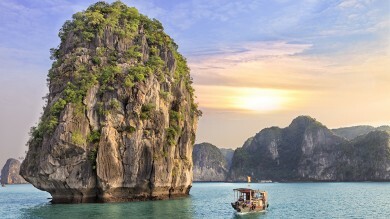 After leaving Hanoi, Ha Long Bay’s enchanting limestone crags provide a wonderfully scenic backdrop to your ride. By contrast, the Imperial City of Hué exudes a peaceful air, with its pagodas, royal tombs from the Nguyen Kings era, ancient Citadel and craft villages. After Hué, Hai Van pass, one of Vietnam’s great mountain passes will spike your adrenaline with its stunning panoramic views of the beautiful blue sea on one side and towering lush green mountains on the other side. If you need to relax and unwind after a long cycling stretch, Nha Trang in the south is home to a particularly delightful stretch of sandy beach and ocean. Just the thing to revitalize those tired legs! Check out this Saigon to Hanoi Cycling Tour and enjoy riding on the National Highway with beach breaks on the way. Many dramas can be avoided by the right preparation before you leave and by bringing the right equipment for a cycling trip to Vietnam. Vietnam has a strong biking culture and bicycles and repair shops are everywhere. However, if you bring your own high-end tricked-out frame, local mechanics may not be equipped to work on your setup. The best time of the year for cycling is October through February when the rainy season ends and the weather gets cooler. If you have a bike emergency, look for a ‘Honda’. They are often great with bikes and motorbikes, and they will often pump your tires, tighten brakes and oil your gears for a modest fee. Keep your eyes open when cycling in Vietnam, as traffic rules are more suggestions than hard and fast rules. Get used to liberal use of horns by the locals, because local custom demands they be used often. In Vietnam, the right of way is decided by who has the largest vehicle – meaning it's rarely the cyclist! On paper, the Vietnamese drive on the right-hand side of the road. Although, that isn't always the case. Cars, motorcycles, bicycles and pedestrians tend to converge from every direction, often using both sides of the road depending on how heavy the traffic is. 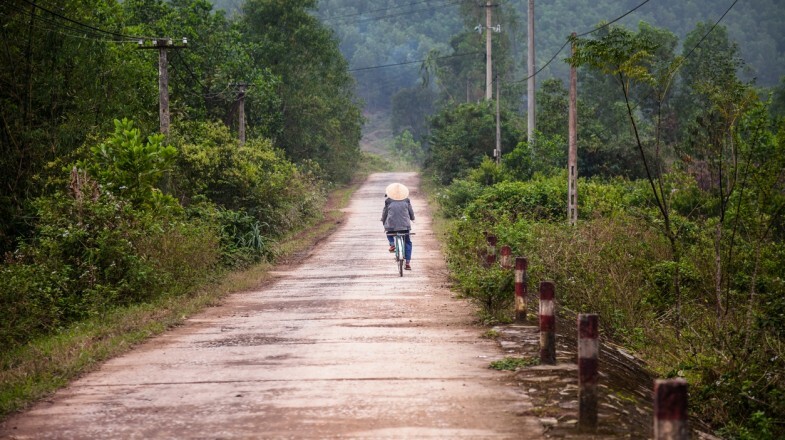 Vietnam is one of the most popular cycling destinations, and it’s easy to see why. From the iconic Highway 1 running the length of Vietnam from north to south to the Ho Chi Minh Highway, there is fabulous scenery to behold, dynamic cultures on view, scenes of everyday city life and lush rice paddies and water buffalo of rural life. The views you see from your bike will stay with you for a lifetime. 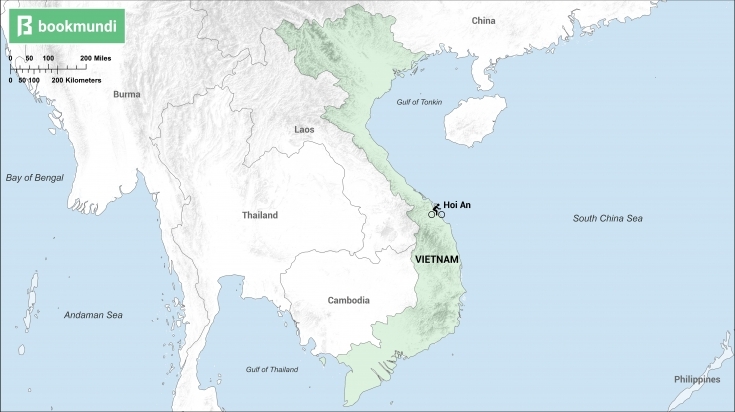 Travelling to Vietnam? Chat with a local travel specialist in Vietnam who can help organize your trip.